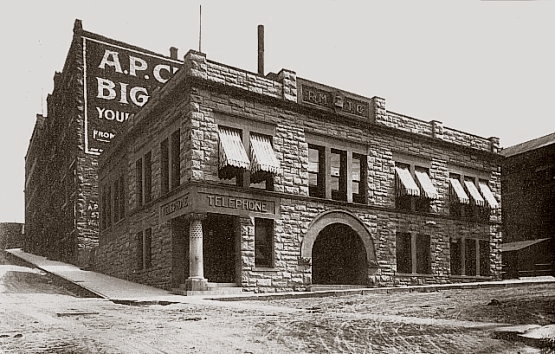 The 1897 Rocky Mountain Telephone Company building, SE corner of Grand St. and Jackson. Behind it is the A. P. Curtin Store on Grand St. A third floor and addition to the back of the building were constructed in the early 1920s. contained the business office, long distance and local service operators for the manually operated central office. It housed equipment and personnel to maintain the Northern Transcontinental Toll Line extending east to west across Montana, and the Helena-Salt Lake and Helena-Calgary long distance networks. the dial exchange building at 441 N. Park following inauguration of dial service in 1955.
telephone firm from Western Life. All equipment was removed from the Jackson St. building in 1966. The footprint of the RMTC building superimposed on a recent satellite photo. Grand Street, which connected Main to N. Warren, no longer exists.